1989 25′ Contender Cuddy Cabin HIN: JDJ00126K889 2014 Honda 250 w/ 368 Hours 5 year Warranty valid until Sept 19, 2019 Tandem Float-On Aluminum Trailer w/ spare - Garmin 1040SX w/ digital gauges - VHF/AM/FM Radio - SeaDek flooring and bolster pads - Trim Tabs - T-Top Side Curtains - Outriggers - Live Bait Well - Detachable Crows Nest - Salt/Freshwater Wash down - 170 gallon Fuel Tank (full and always ran w/ non-ethanol gas) - Insulated in-floor Fish Boxes - Deck Lights - Fresh Batteries - Full Covers (boat and engine) - Safety Gear - Lots of extras!!! This is one of the best-maintained vessels seen. Without even having to say, one of the cleanest. No rust or corrosion. Clean wiring with labeled breaker panel. No hull dings or repairs to be seen. All storage boxes are accessible and clean. Stock #143177 Excellent condition! Meticulously maintained! Tons of bells & whistles included! If you are in the market for a center console, look no further than this 2003 Contender 27 Open, just reduced to $82,500 (offers encouraged). 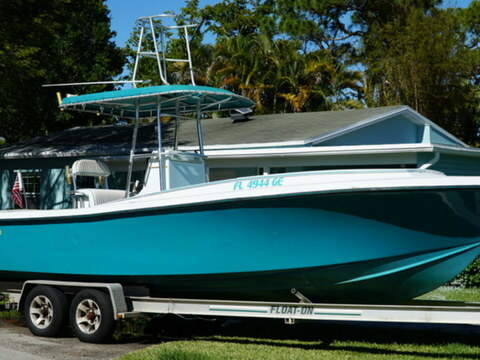 This boat is located in Boca Raton, Florida and is in great condition. She is also equipped with twin Yamaha engines that have 1,064 hours. The owner has owned this boat for the past five years and taken great care of her! A local Marine Mechanic takes good care of her and records can be reviewed at inspection time. The owner reports that all listed features are working well. Stock #141641 Extremely well maintained Contender 31 with cuddy and lightweight Yamaha 250hp HPDI's! If you are in the market for a center console, look no further than this 1997 Contender 31 Cuddy, just reduced to $69,995 (offers encouraged). This vessel is located in Merritt Island, Florida and is in great condition. She is also equipped with twin Yamaha engines that have only 250 hours. Reason for selling is ready to sell! The condition of this boat is excellent. Well kept and many new features. NEW UPGRADES - 3 new fuel tanks: 1 - 140 gallon 3/16" aluminum center tank with/new WEMA sender 2 - 80 gallon 3/16" aluminum side tanks with/WEMA senders New Fuel supply hoses New Batteries New fuse panel/ground bar/bus bar/and new wiring New hoses to the Fresh Water wash down New Diver 3 Step Stainless Steel Ladder and Wind line Transom Mount Safety Bracket New Canvas Awning for the bow New Upholstery New bottom paint New Awl grip and non-skid texture to deck and top deck Stock #137738 A fishing machine! Excellent condition Tournament! Many new upgrades! Loaded and ready to hit the water! If you are in the market for a center console, look no further than this 1995 Contender 31 Tournament, priced right at $77,300 (offers encouraged). This boat is located in Lighthouse Point, Florida and is in great condition. She is also equipped with twin Yamaha engines that have 800,900 hours. 1965 Columbia Contender Highway trailer included. 2017 Contender 28 T Just in time for the Kingfish Season, a special edition Carolina Contender. This 2017 Contender 28T is powered by Twin Yamaha 200 4-strokes with an additional upgraded leaning post livewell to give the tournament angler a total of two livewells and ample fish box storage for any type of catch you may be pursuing. Call Sportsman's Choice Marine at 843-399-9283 for a complete list of additional equipment or to get more information on this brand new 2017 Contender 28 Tournament! 2005 Contender 31 Center Console 31 Contender Nice Boat! May keep boat on Davit for One month Everything you need for fishing! Garmin GPS Cooler 2 Yamaha 250's, 2005 with 800 hours FINANCING AVAILABLE!!! 2017 Contender 25 Tournament Shes finally here! The ALL NEW 2017 25T is the newest re-model from Contender. Twin Yamaha F200XCAs (fly-by-wire), custom Ttop, much more! Just arrived, more info and pictures to come.